Oh golly. I seem to have a problem! 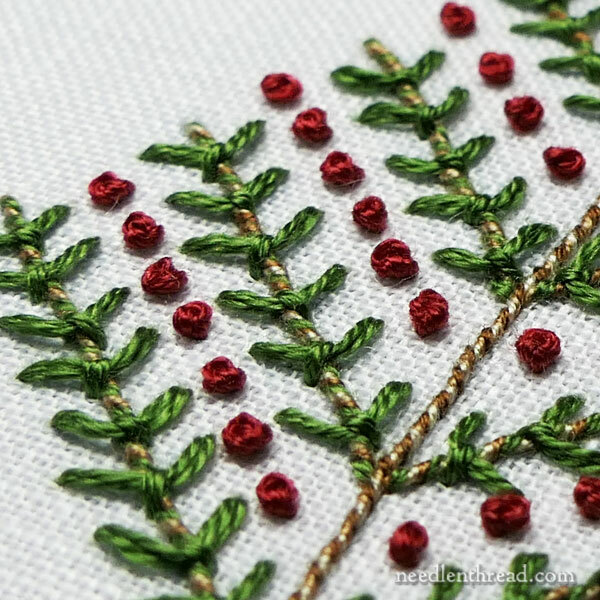 I’ve started embroidering some little trees – using simple stitches worked in various combinations – and they have turned into a bit of an obsession. I am, in short, addicted to them. Every hour I spend away from my needle and thread, I’m aching to get back to stitching. My mind whirs with new possibilities, and everything I have to do in Real Life – you know, the stuff you can’t avoid day to day? – I do with haste, so I can return to my stitching post and test my newly-hatched ideas. It’s an obsession that creeped up on me, unawares. I had no intention of getting involved in a whole series of stitchy things right now. I came upon a page that featured some vintage stylized tree shapes. Very Arts-and-Crafts-Era. Simple in concept. Brief in line. Nothing elaborate. I said to Myself, Self, you ought to clean up This One, and see how it stitches up. Myself replied, You don’t really have time to get involved in a new project right now. And of course I capitulated and listened to the Voice of Reason. In a couple Very Satisfactory hours, I had a completed embroidery project that was rather pleasing. It was cute. It was, in fact, kind of pretty. It was uncomplicated. Fun to stitch. Perfect for a quick embroidery fix after a busy day. And that’s actually when the problem started…. I headed back to my computer and started messing with trees. There were six at first. And then I went out to my work room and checked out my fabric supply. Lo! I found the stack of leftover little linen squares that I had prepared (whipped edges and all) several years ago for a local class. I even had backing fabric cut and ready, all neatly stacked in a box. And – my goodness! – upon counting them, there were some 29 little squares there! I also found a 45″ long strip of linen, 6″ wide. And then the ideas really started boiling over. After all, what can one do with a six-inch wide strip of linen that’s 45″ long? And this is when I said to Myself, I’m in trouble. Next thing I new, I was doodling everywhere. And then I betook myself to my computer and changed my doodles into clean line drawings. I ended up with 18 doodles in that session. Some I liked more than others, but all were worth testing to some degree. I tweaked them all to the same height (3″ tall), printed them, and ran back out to the workroom, where I transferred them to 18 little squares of linen. Then I ransacked my thread drawers, pulling out cotton threads only, and focusing on Christmas colors. Not all my trees were typical Christmas trees – and they could definitely be stitched in any color scheme, any time of year – but the mood had struck. And I could see each of them sporting their holiday garb in one way or another. And so, Christmas it was! With the excitement of a newly-launched project bubbling over within me, I ransacked my bead trays. After all, if you’re going to deck the halls…or the trees… you might as well have a little bit of sparkle here and there! I dumped all the threads into a bag, everything else into a box, grabbed as many 4″ hoops that I had lying about, threw in a pair of scissors and a pincushion stuck full of common needle sizes, and I was good to go! I figured any time the hankering arose for a quick embroidery fix, I could just grab a tree. But then the hankering kept rising… and lately, it’s become a permanent state of mind. All I want to do is Stitch Trees!!! I’ve been photographing the trees along the way, and on December 1st – if nothing goes amuck between now and then – you can join me in my obsession! I’m putting together a group of my favorites for you. If you want a perfect antidote to the over-hectic holiday season, something that allows you to slow down, relax, and pause for a while, join me on December 1st! You can find my e-book Twelve Trees for Christmas available now here, featuring the Christmas trees above, plus many more! 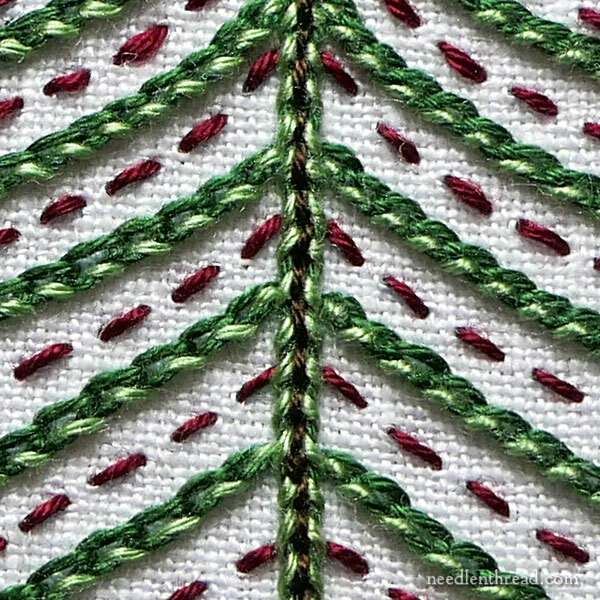 You’ll find patterns and step-by-stem instructions for twelve small trees to stitch for Christmas – or you can mix up the colors and stitch them for any time of the year! November 27, 2017 More Addictive Stitching & a Cyber Monday Sale! The sneak peeks are awesome–I can’t wait to see your little trees! I love these!!! I can’t wait to see them and start my own forest. Thanks so much for the great idea. I can’t wait for those trees!!!!!!! You have it all!! 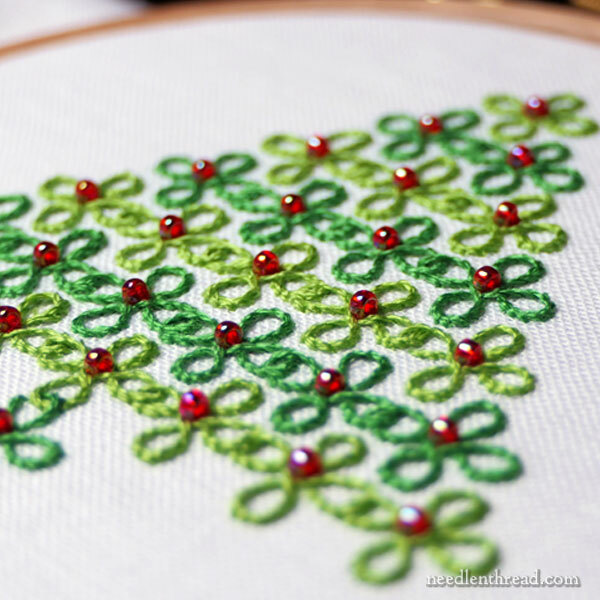 Simple stitches, fast stitching, all in Christmas colours et trees!!!!! I just LOVE Christmas trees!!!! And they’ll make the perfect gifts!!! Thank you so much for sharing! I’ll make time in the evenings of December to work on those. Couldn’t have said this better myself! I agree! Oh my goodness!!!! I was in love when I saw the first tree! And the 4th and 5th….These would make great handmade Christmas gifts. Yay! When you post on Dec. 1st please include ideas re how to make a complete gift such as- framing, ornament, etc. Haven’t made a handmade Christmas gift in years – looks like your tree obsession may become mine! Looking forward with great anticipation to 1st December – the snippets you’ve shown us are tantalising! Well, that was a lively article and the more I saw, the faster I read. Your excitement came through like a siren song. And the photos were like candy dangling in front of me. These are the type of projects even a beginner like me could do. I love to stitch up things to make into cards for friends. It looks like you’ve created the perfect projects for that. Mary… Wow…these little trees are incredible!!! And as little projects…I can’t wait! Your sneak peeks did it! I. Am. Hooked!! December 1st can’t get here fast enough!!! 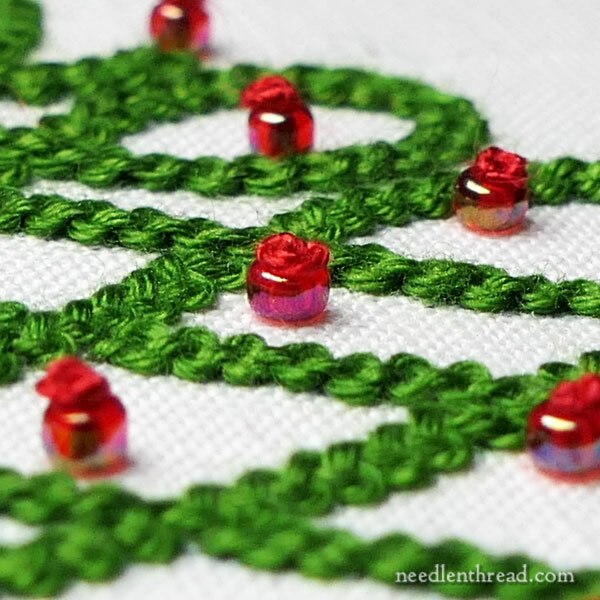 These are beautiful, how did you stitch a french knot in a bead would love to know. Can’t wait to see the progress on these trees, These would make lovely Christmas decorations. I’m really looking forward to the give-aways especially the scissors. I do hope you have a lovely Thanksgiving and enjoy your holiday. Oh my! I can see how you could become obsessed with those little trees. They’re so cute-and almost-instant gratification as well. 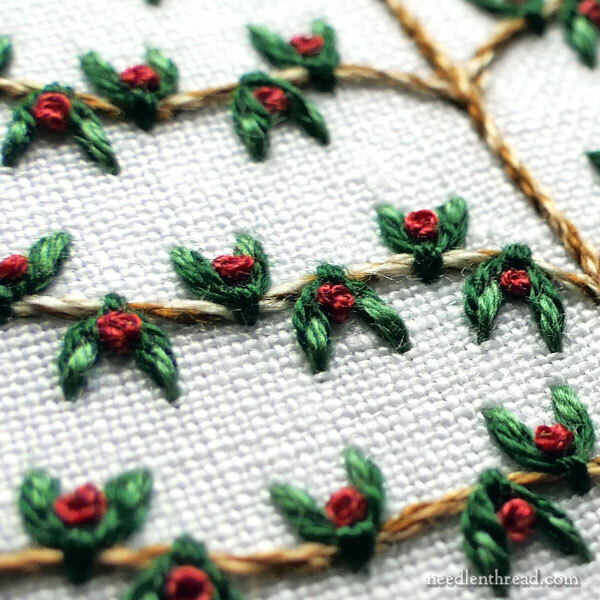 I’ve been hankering to stitch something Christmasy, but it needs to be simple and fast as my health issues haven’t allowed much concentration. Your trees may be just the inspiration I need! And to get a jump on Thanksgiving… THANK YOU, Mary, for your wonderful blog and website! I love seeing your posts – every single one makes me smile! Whether it’s colors or shapes or educational information or just inspiration in general, I know when I go to your blog I will smile 🙂 Thank you, thank you, thank you! Lovely obession Mary ! Are you going to sew all your little squares together to make a tree patchwork? Beautiful trees, what we could see. Looking forward to the rest. You definitely need to answer the call of creativity when it rings – we all benefit! Thank you for all of your work, creativity and inspiration. I have enjoyed all of your projects even those I know I will never tackle. Your site if very helpful and has guided me through problems that have come up. Looking forward to trees and everything else in the future posts! How many of your readers are like me, seeing the title of this post and wondering what is about to be their own new stitching obsession?? December 1, here we come! Happy Thanksgiving! I think of you with gratitude every single time I sit down to embroider because you have improved literally everything I was doing before I found your site and made possible so many other techniques and projects. Here’s to you! Mary; So glad to see the tree again (accidental deletion of previous email). Can’t wait to see what you have in mind. I , too, am enchanted by trees. Doing ornaments right now so it really fits in!! Wow, Christmas trees! The Christmas tree is the favorite thing my husband and I like to decorate. He is now in a long term care facility and this would be a great way to decorate at tree and bring to him. Thanks for the idea. I can’t wait!! If there’s one thing I love, it’s trees. I’m a dyed-in-the-wool born and bred Pacific Northwest tree-hugger! And I would love nothing more than to stitch them. Your photo teases are absolutely tempting! And lo! Thou didst embroider my heart and make the holidays shine. Oh dear. A disease with no cure!!! Happy Holidays, Mary. And may all your trees be 6″ high!! I am looking forward to viewing your trees. You had so much enthusiasm in your article that it just came bubbling out and was quite infectious. Have a Happy Thanksgiving. Would love to find some patterns for them, maybe you can put together some that I can purchase. What fun! I started one Christmas project out of desperation for something to stich. that one is done now…I can’t wait to see what you’re coming up with next. I downloaded the kaleidoscope E-book and have tucked it aside. Many of them require time, but little quickies are so much fun during this busy time of year. I bought a Christmas tree kit from Inspirations and was going to start it today but you put the bug in my ear too. Was going to jazz up the result but then I thought, why not start from scratch, likeMary did and see what turns out? So, you’ve really inspired me today. I’m new to this but you have to start sometime. Those trees look delightful! Roll on 1 December – I’m slogging through 2 large WIPs and could be diverted oh-so-easily. I can’t wait to see them! Projects like this are just what I need right now! Dear Mary, A wonderful post and what sweet little trees!! Looks like that article was only waiting for you to find it and then everything fell into place. That linen was a lucky find, though, and very inspiring. I must go a’hunting. Very pretty and festive. I imagine a little line of Advent trees! I am already excited about the Christmas give-aways. Hopefully this time ………. I might win one of your special treasures! You are having a Tree Ball. Haven’t heard you wax so enthusiastic about a project for a long time. It sounds as if you are now healthy too and that is wonderful. Being a stitcher is just so much fun. Looking forward to seeing your forest! I need to see more!!! I love Arts & Crafts era and the simplicity. I can’t wait to see the trees! The pictures you have shared so far look gorgeous! These are so very sweet — look forward to seeing them all in their entirety. Mary, I’m so happy to have found you! This article was such a joy to read! Thank you, and Happy (belated) Thanksgiving! This was one of the MOST delightful blogs …..I felt as if I was running down a trail with a huge surprise on either side as you revealed the description of your trees. Is there a pattern for these 2 trees? They are so pretty. Like the idea of Tiny trees. What a great gift idea, you could put them in cards, use as tags, put on kids clothes ( great on pocket or bib overalls) or make a lovely wall hanging. Have to add on… this whole tree mix would make a great stitch “sampler” forest… THANK YOU! The trees are lovely, are there patterns ? Love your tree designs, will try a few myself. Thank you for sharing lovely work with us. I’m looking forward to this. I love your site, designs and videos! Mary, so pleased about your news via personal note. I believe your own positive outlook also made a difference to how things went. Also, the Christmas trees, they are going to be a stitching must☺☺. Looking for to seeing them in fuller detail. Just came across your site while looking for some needlework ideas. I want to start getting into it again, I haven’t done this in years. I work, so I don’t have tons of free time, but I might do a winter project. You do beautiful work! Mary love the trees. wonderful as always. The edges could be cut out with peaking sheers and the felt square is used as a cover for a needle book. Yes I did think Xmas trees, pine needles, so needle books. Great little gifts to give to other sewing divas. Just a thought. As if we don’t have enough on at this time of year. You could probably do something for your Thanks Giving. Maybe a stylised simple turkey shape for the cover? Thanks so much, Martha! I’m glad you like them! I like your Thanksgiving idea! As I have indicated in the past, I am a left handed embroiderer and have done my best to adapt the various stitches into use for left-handers with the help of books for lefties. Right now I am working on the Circular Padded Christmas Ornaments described in Pinwheel Ponders. I am placing a picture on one side and a phrase and date on the other for use on my Christmas tree. I don’t use counted cross stitch however, I use various embroidery stitches and shade with crayons like described in one of your Needle N’ Thread articles. The little trees will be perfect for this! I would enjoy receiving supplies such as floss, ribbons and sequins as well as patterns for Samplers to hang on the walls. As a matter of fact, I would be thrilled to win anything in a drawing, as I have never had any luck in this area! Me han gustado muchísimo tus árboles. Estoy adaptando el diseño para poder bordarlos en punto Beauvais, y con el agregado de cuentas quedarán excelentes. Gracias! Thank you, Emedelce! I’m so glad you like them! Previous Previous post: Tulip Festival Part IV – The Finish!